UK, 1976, 114 minutes, Colour. Malcolm Mc Dowell, Christopher Plummer, Simon Ward, Peter Firth, Sir John Gielgud, Ray Milland, Richard Johnson, Michael Hordern. 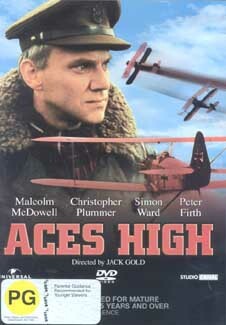 Aces High is an adventure for adults in the sense that there are many effective aerial combat sequences which are exciting, but which are placed in a context of serious, intelligent drama about World War I. The film is certainly a 70s look at the enthusiastic patriotism and honour that motivated the young and fairly inexperienced recruits. There is a sardonic irony in the humane touch and genuine acknowledgement of fear and its consequences. Malcolm Mc Dowell and Simon Ward are cast uncharacteristically but effectively. Christopher Plummer gives a warm performance and Peter Firth holds the film together as the young man who embodies the experience of 1917. It is a reworking of R.C. Sheriff's classic play, Journey's End. 1. Why was this film about World War I made in the 70s? For what audience, for what purposes? The film as history, anti-war? The variety of tones and moods within the film? Critics did not like it. Why? 2. The significance and emphasis on the title? The tone of heroism, the irony? Did this indicate the treatment of the themes? 3. The film was based on a play called Journey's End. Was it evident that the film was based on a play? How confined was it in its situations, characters and dialogue? The basic message and moralising of the film? 4. The significance of the structure of the film? The irony of the opening speech, the introduction to Croft and Gresham,, the seven days and their impact? Croft as the central character? Could the audience identify with him and move through the experience via him? 5. The appropriateness of the opening speech? Its ironies, the tendency to overstatement, the role of the headmaster, school tradition, Britain and its heritage. young men and patriotism and loyalty? The irony that it was Gresham speaking it? Croft and his starry-eyed hero worship? The two strands developed throughout the film? 6. How well did the film keep Croft as the focus? What kind of schoolboy was he, what British values did he stand for. the enthusiasm and attitude towards the war? As seen with his school friends, within the context of his family? His attitude towards glory, goals, hero worship and wanting to be with Gresham? The strings that were pulled to get him there? The role of his sister? What did he begin to learn on his arrival in France with this background? 7. What happened to Croft during the seven days? What did he learn about the reality of war. about the reality of soldiering, about Gresham and his authority. Orders, fighting? The reality of mud and crashing, of blood and death? The influence of the other men on him? The comradeship, the devotion, patriotism? The visit to the brothel and what he learnt from the French girl? The futility of his death? Was this a comment on what happened to the young men of world War I? 8. How central was the character of Gresham? A young man who could have been like Croft? His fears and his authority? His headquarters in France and the way that he controlled the men? His skill in flying and deceiving the enemy as illustrated? His reliance on drink for his command? His reliance on Sinclair, his authority over Crawford? His deliberately trying to down play the relationship with Croft? Reading Croft's letter and discovering the hero worship? The impact of Croft's death, of the new recruits arriving? 9. How convincing a character was Crawford? What aspect of war and antiwar did he represent? His cynicism, his fears. the influence on Croft, attitude towards Gresham's authority.. relationship with the other men? His nervous fears, neuralgia? The impact of his going mad and imagining that he was a 'plane'? Convincing, overstatement? 10. The portrayal of Thompson: as one of the boys, the ordinary young man out flying, not hero material but the ordinary man? 11. The contrast with Sinclair: how sympathetic a man, the wise uncle, the dignity of soldiering patriotism, the personal concern for the other men, his culture and his music, sympathy? His support of Gresham, influence on Croft? The gallantry of his going on the impossible mission? The pathos of his death? What attitudes towards war did he represent? 12. How did the film highlight the attitudes of comradeship within the war? The confined barracks in France? Meals, drinking, singing, going to the French town, the brothel? 13. How did this contrast with the presentation of the officials, their meals, double talk, planning. etc.? Were these sequences convincing? The use of guest stars in these sequences? 14. How contrived was the visit to the brothel? The romanticism for Croft, the reality of the French people, the attitudes of the English flyers? Croft and the sexual awakening? The later disillusionment? Conventional material? How well done? 15. The glamour in the film of the flying sequences? How impressive were they, their placing throughout the film? Gresham as an Ace? Croft and his missions? The mission with Sinclair and its danger? The shooting down of the observer balloons? Croft's death? Did the film pay tribute to the Aces of World War I and what they really achieved? 16. What was the audience left with at the end of this film? A good drama, a good study of themes, irony?